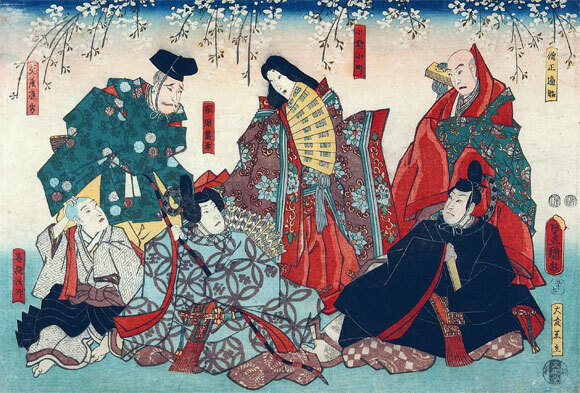 The five-role hengemono "Rokkasen Sugata no Irodori" was staged in the 3rd lunar month of 1831 at the Nakamuraza. It starred Nakamura Shikan II in the five roles of Sôjô Henjô, Ariwara no Narihira, Bun'ya no Yasuhide, Kisen and Ôtomo no Kuronushi. His stage partner in the role of Ono no Komachi was Iwai Kumesaburô II. The dance was divided into 5 sections : "Henjô" (Gidayû), "Bun'ya" (Kiyomoto), "Narihira" (Nagauta), "Kisen" (Kiyomoto/Nagauta) and "Kuronushi" (Nagauta). A group of kanjo are discussing about a poetry competition in which Ono no Komachi, a beautiful and talented poetess, is expected to take part. The high priest, Sôjô Henjô, arrives dressed in the robes of his order and silk surplice. Komachi appears from behind a latticed screen. Despite his religious vocation he is smitten with Komachi and he woos her only to be rejected. Komachi watches him leave and then withdraws with all the kanjo. The mood changes abruptly with Bun'ya no Yasuhide rushing on in search of Ono no Komachi who has disappeared behind the screen . Bun'ya tries to catch a glimpse of her but he is stopped by the kanjo. Bun'ya proceeds to lament Komachi's coldness towards him and the fact that his letters to her have always been ignored. As he does so, he capers with the kanjo as if he were amusing himself in the pleasure quarter. The kanjo force him to join in a riddling game based upon the word koi (love). Bun'ya eventually tires of all this and he hurries off in search of Komachi, pursued by the irate kanjo. Ariwara no Narihira and Ono no Komachi are revealed from behind the screen. Narihira is in elegant hunting attire (kariginu) and Komachi wears the twelve-layered kimono of the time. Narihira pays court to Komachi in an elegant and restrained dance, which creates a mood quite different from the previous section of "Rokkasen". The scene changes to the Gion district of Kyôto, the only section of the dance performed in an outdoor setting. Kisen enters on the hanamichi. He is the chief priest of a local temple and he has escaped from his religious duties to come and admire the cherry blossoms. The gourd he carries, which contains sake, can be floated along a stream . As Kisen admires the scenery, a serving girl named Okaji brings him tea. Kisen, who is enamoured of Komachi, is astonished when he realizes who she really is and, in his confusion, he spills the tea. Kisen then proceeds to flirt clumsily with her and she performs a short dance, alone, describing the uties of a teahouse waitress. Kisen then dances a well-known chobokure based upon the antics of wandering beggar-priests who, waving a short staff with metal rings, would beg for alms outside people's homes by reciting Buddhist scriptures, performing comic dances and telling funny stories. Monks from Kisen's temple then come in search of Kisen and they perform a sumiyoshi odori. Kisen then dances again, a cloth on his head in imitation of a maid at a roadside inn trying to attract customers. The dance ends with Kisen posing under a large parasol, the chorus warning of the divine retribution in store for priests who break their vow of chastity. This section derives from the Nô play "Sôshi-Arai Komachi"  in which the poet Ôtomo no Kuronushi engages in a poetry-writing competition with Ono no Komachi. Fearing defeat, Kuronushi has succeeded in discovering in advance which poem Komachi plans to use during the competition. Kuronushi then writes this poem on a leaf of a copy of the ancient poetry anthology, the "Man'yôshû" making it look as if Komachi's poem is one already published in the collection. When Komachi recites her poem at the competition, Kuronushi then accuses her of having plagiarized it from the "Man'yôshû". Komachi, however, "washes" the page and the poem disappears proving that Kuronushi has written the poem himself in the manuscript. Komachi also reveals that Kuronushi plans to seize control of the country. The dance ends with Komachi posing in triumph while Kuronushi, his scheme thwarted, draws his sword and glares. Ono no Komachi does not, in fact, appear in this section but she is assumed to be behind the screen. This is a reference to a game but also to the "floating world" of sensual and carnal pleasures. Literally "Komachi washing the manuscript".